Personal & Grooming items for the Civil War soldier. Razors, combs, soap, wallets, folding mirrors, folding knifes, and more personal add authentic details to your Civil War experience. The Gum Blanket is made of Waterproof and Fire Resistant Black Cloth treated with an silicone rubber coating. The Gum Blanket DOES NOT FEEL LIKE RUBBER. The Gum Blanket FEELS LIKE STIFF FABRIC. There is a grommet at each corner of the Gum Blanket. The Gum Blanket is approximately 4 feet x 6 feet in size. Since this is a blanket there is no neck hole. The Gum Blanket goes under your bedroll and insulates you from the cold and damp of the ground. 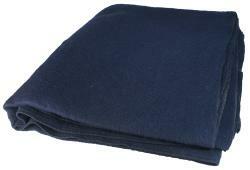 The Gum Blanket is made of rubber coated canvas with edge grommets. Since this is a blanket there is no neck hole. The gum blanket goes under your bedroll and insulates you from the cold and damp of the ground. Approximately 4 feet x 6 feet in size. 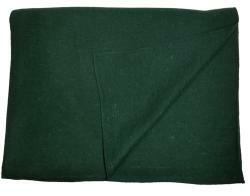 This heavy weight, 3.75 pound Wool Blanket is 66 inches x 84 inches. This soft wool blend blanket is not scratchy. Wool is a natural fiber that breathes in hot weather and insulates in cold. The wool yarn from two directions are actually woven together producing a very durable, warm and long lasting wool blanket. Naturally flame retardant. Machine wash & dry: Machine wash on a gentle cycle, add fabric softener to the final rinse and tumble-dry on low heat. Proudly Made in USA. Click on the picture to see additional, larger pictures. 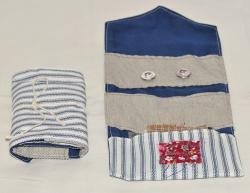 Click here to read a good article on how to Make and Pack a Blanket Roll. The Poncho is made of Waterproof and Fire Resistant Black Cloth treated with an silicone rubber coating. The Poncho DOES NOT FEEL LIKE RUBBER. The Poncho FEELS LIKE STIFF FABRIC. The neck hole is faced so there are no exposed raw fabric edges. There is a grommet at each corner of the Poncho, 2 grommets along the front bottom hem, 2 grommets along the back bottom hem, and 4 grommets along each side for a total of 16 grommets. The Poncho is approximately 4 feet x 6 feet in size. The Poncho is a complete, ready to use Civil War raincoat. Made with rubber coated canvas, reinforced neck hole. Authentic replica of original. Authentic reproduction of old-time horn comb. Made from real horn. 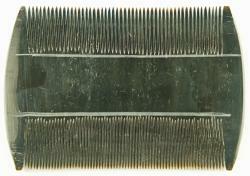 Authentic reproduction of old-time double sided horn comb. Made from real horn. Even during wartime, personal grooming remained important. Most men had a shaving kit of some type. This shaving box is typical of the period. 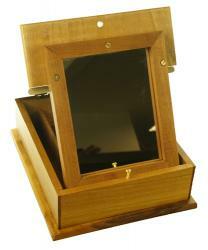 The small mirror attached to the inside of the lid is propped upright when the box lid is opened. Inside 2 dividers help organize shaving implements. The box can also store toothbrush and powder, small scissors, needle and thread. The shaving box measures approximately 9" long x 7 1/2" wide x 3" deep.The box is finished with hand-rubbed linseed oil. 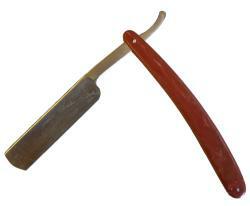 Period style straight razor that is very close to the originals. The razor has a steel blade and has a faux horn handle. Faux horn is a burnt umber clay color. The shaving brush is handmade using only the world's finest quality 100% natural boar bristle. Natural or dark bone colored handle. Total length is 4.25”. Imported. Period style HAND STITCHED tri-fold Wallet or pocketbook made of quality leather with a strap closure. All leather with 2 interior pockets. When folded, the wallet is 8 inches x 3 1/2 inches. 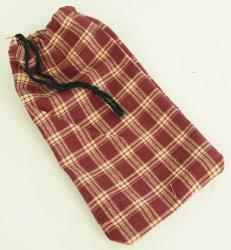 The wallet measure approximately 8 inches x 10 1/2 inches when open. Available in Black, Brown, or Natural (Undyed) Leather. Period style tri-fold Black leather wallet or pocketbook with a strap closure. All leather with 2 interior pockets. When folded, the wallet is 6 inches x 3 inches. Period style tri-fold canvas wallet or pocketbook with a strap closure. 2 interior pockets. When folded, the wallet is 6 3/4" x 3 3/4". When open, the wallet is 6 3/4" x 9 3/4". Period style tri-fold tarred canvas wallet or pocketbook with a strap closure. 2 interior pockets. When folded, the wallet is approximately 6 3/4" x 3 1/2". When open, the wallet is approximately 6 3/4" x 9". Wood matches in a Civil War period correct box. In 1827, John Walker, English chemist and apothecary, discovered that if he coated the end of a stick with certain chemicals and let them dry, he could start a fire by striking the stick anywhere. These were the first friction matches. The chemicals he used were antimony sulfide, potassium chlorate, gum, and starch. Walker did not patent his "Congreves" as he called the matches (alluding to the Congreve's rocket invented in 1808). Walker was a former chemist at 59 High Street, in Stockton-on-Tees, England. His first sale of the matches was on April 7, 1827, to a Mr. Hixon, a solicitor in the town. Walker made little money from his invention. He died in 1859 at the age of 78 and is buried in the Norton Parish Churchyard in Stockton. In 1829 Samuel Jones saw Walker's "Congreves" and decided to market them, calling his matches "Lucifers". 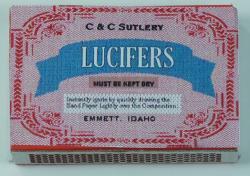 "Lucifers" became popular especially among smokers, but they had a bad burning odor. In 1855, safety matches were patented by Johan Edvard Lundstrom of Sweden. Lundstrom put red phosphorus on the sandpaper outside the box and the other ingredients on the match head, solving the problem of "phossy jaw" and creating a match that could only be safely lit off the prepared, special striking, surface. 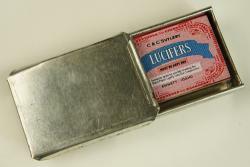 This little tin match box holder is just the right size to hold one of our boxes of Lucifers. The sliding cover protects everything from the elements. The box measures approximately 2 5/8" x 1 3/4" x 5/8". The cigar box is made of tin and measures approximately 7 1/4" x 2 1/2" x 5/8". The lid is hinged for easy opening and closing. This handy box can be used for other items as well. The Quill Pen is for writing with ink from ink bottles. The quill is about 16 inches long. Click on the image for more pictures. Proudly Made in USA from the Great State of Idaho. Here is how you fashion the nib of your quill pen. LIGHT, LIGHT, LIGHT!!! Hold the quill as if writing and make small circles with it on the back of your other hand (Try this without ink. :) ) When you can make slight indentations on your hand without leaving a slight scratch mark, you are using the proper pressure to write. 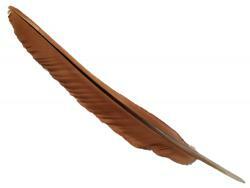 The pressure most of us use to write with today is way, way, too hard to use with a quill. Use a good calligraphy ink. DO NOT USE INDIA INK WHEN USING A QUILL! India ink has too strong an adhesive quality, and will not flow freely from a quill...Actually, I recommend that you do not use powdered ink when starting out. Go to an art store and ask for calligraphy ink." 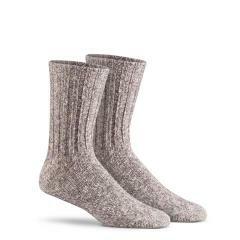 Classic Ragg Wool Crew heavy weight performance socks add thermostatic insulation keeping you warm and comfortable all day long. 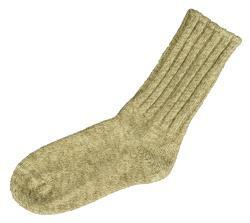 The nylon core helps socks retain their shape. Wool provides natural insulation that keeps feet warm. Breathable knit construction keeps feet dry and comfortable. Heel and toe are reinforced with nylon to add durability and longer sock life. Made with elastic ribbing in the cuff and leg to provide a relaxed stretch fit to reduce pinching and fatigue. Ragg wool made of 80% Wool, 19% Nylon, and 1% Spandex. Brown/Gray tweed. Our Wick Dry CoolMax Liner socks pair perfectly with these socks to protect your feet from hotspots and blisters. Size Medium fits shoes sizes: Men's 6-8.5, Women's 7-9.5, EU 39-42. Size Large fits shoes sizes: Men's 9-11.5, Women's 10-12.5, EU 43-46. Click on the picture for larger image. Machine wash warm inside out, no bleach. Tumble dry low. Do not iron. Do NOT dry clean. NEW! Heavy weight performance Crew socks in a blend of Cotton and Ragg Wool. Cotton is a natural lightweight, moisture-absorbing fiber that is soft, breathable, and washable. Ragg Wool adds classic thermostatic insulation keeping you warm and comfortable all day long. 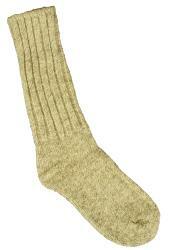 The nylon core helps socks retain their shape. Wool provides natural insulation that keeps feet warm. Breathable knit construction keeps feet dry and comfortable. Heel and toe are reinforced with nylon to add durability and longer sock life. Made with elastic ribbing in the cuff and leg to provide a relaxed stretch fit to reduce pinching and fatigue. 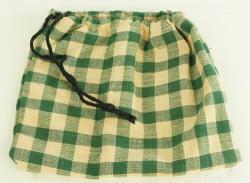 Made of 66% Cotton, 28% Wool, 5% Nylon, and 1% Spandex. Gray tweed. 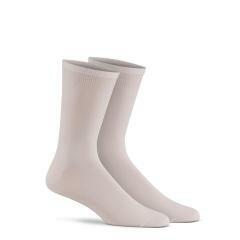 Classic Ragg Wool Mid-Calf heavy weight performance socks add thermostatic insulation keeping you warm and comfortable all day long. The nylon core helps socks retain their shape. Wool provides natural insulation that keeps feet warm. Breathable knit construction keeps feet dry and comfortable. Heel and toe are reinforced with nylon to add durability and longer sock life. Made with elastic ribbing in the cuff and leg to provide a relaxed stretch fit to reduce pinching and fatigue. Ragg wool made of 85% Wool, 14% Nylon, and 1% Spandex. Brown/Gray tweed. NEW! You need a liner to protect your feet. Liners create a friction barrier between your feet, your sock and your footware. This helps resist blisters and keeps your feet dry by moving moisture into your outer sock. Stop the heat on your feet through added breath-ability and moisture management with CoolMax Polyester and Wick Dry technology. CoolMax polyester is a high-performance fiber engineered to move moisture and speed the evaporation of perspiration. It is superior fiber for wicking action, moisture absorption and transport. Wick Dry technology quickly draws moisture away from your skin so your feet stay dry and comfortable. Removing the moisture build up reduces hot spots and friction that causes blisters. These liners pair perfectly with our classic Ragg Wool and Cotton/Ragg Wool blend socks. Made of 93% CoolMax polyester, 6% Nylon, and 1% Spandex. White. Heavy canvas gaiters cover the leg and shoe lacing to protect the pants and legs from underbrush and moisture. 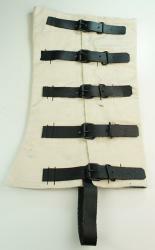 The gaiters are closed with 5 leather straps with buckles. A leather stirrup keeps the gaiters from riding up. The gaiters are made to fit your desired length and are available in sizes Medium, Large and Extra Large. Measure from the desired location over the back of your shoe to your desired height on your leg to determine your length. Medium is 12 1/2" high, Large is 12 3/4" high, and XL is 13 1/2" high. Heavy canvas gaiters cover the leg and shoe lacing to protect the pants and legs from underbrush and moisture. The gaiters have 7 pewter buttons and are available in sizes Small, Medium, Large and Extra Large. Measure around the widest part of your calf to determine your size. Small fits 13", Medium fits 15 1/2", Large fits 17", and XL fits 19". Proudly MADE in the USA in the Great State of Idaho. Tarred canvas gaiters cover the leg and shoe lacing to protect the pants and legs from underbrush and moisture. 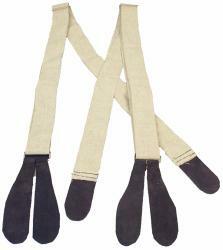 The gaiters have 5 adjustable leather straps and an adjustable under-the-foot strap. Available in sizes Medium, Large and Extra Large. Measure around the widest part of your calf to determine your size. Medium fits 15 1/2", Large fits 16"-17", and XL fits 18". 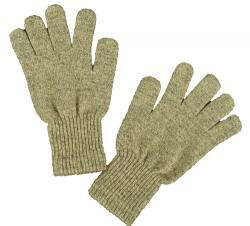 These mid weight premium ragg wool gloves keep hands warm without added weight. Elastic cuff keeps wrists covered and warm. Available in Large only. Brown/Gray tweed. Click on the picture for a larger image. Proudly Made in USA. Content: 85% wool, 15% nylon, except 2% spandex added to cuff. Hand wash, warm water, mild detergent. Gently wring by hand. Lay flat to dry. Large = 9-9.5" palm circumference. To determine your Palm Circumference measure the circumference of your writing hand at the knuckles in inches. 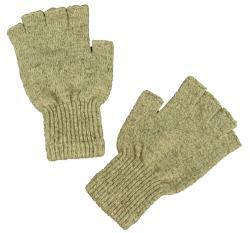 These mid weight premium ragg wool Fingerless gloves keep hands warm without added weight. Elastic cuff keeps wrists covered and warm. Available in Large only. Brown/Gray tweed. Click on the picture for a larger image. Proudly Made in USA. The men's white dress gloves are made of all cotton. One size fits most. 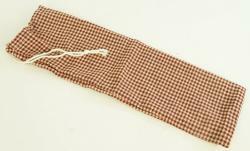 The bandanna is made of quality 100% cotton and measures about 22 inches square. Double sided printing. It is available in Red or Navy Blue. Imported or Made in USA. 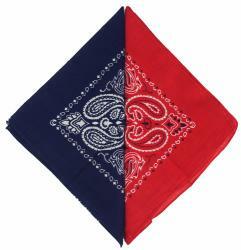 The bandanna is made of quality 100% cotton and measures about 22 inches square. Double sided printing. It is available in Solid Yellow. Pre-tied silk cravat with authentic buckle in the back. Available in black silk only. Pre-tied cotton cravat with authentic buckle in the back. Available in black cotton only. 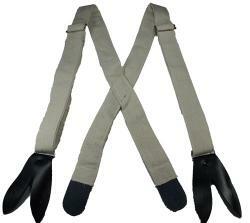 Durable adjustable canvas suspenders with buckles and leather ends. A very important clothing accessory for holding up you trousers. Proudly Made in Idaho USA. Metal was a very common material for buttons during the Civil War. These buttons were not tarnish-proof and contact with finger oils, air, and the elements guaranteed these buttons did not stay shiny for very long. Both military and civilian clothing sported these tarnishing metal buttons. The Civil War was in many cases a "spit and polish" war for the troops and a button board was a must have. The board is slipped over the uniform button when polishing it to prevent the uniform from getting stained by the polishing paste. Button polishing passed the soldiers' boredom, especially during the winter months. While officers often had metal polishes and cleaners, the soldier used fire pit ash as a substitute. This button polishing board has a handle, measures 8.5" x 1.75" and is stained with linseed oil. Choose Pine or Poplar wood. The Button Board is referenced in Civil War Collector's Encyclopedia vol. V page 31 by Francis A. Lord. This rectangular button polishing board measures 8.5" x 1.75" and is stained with linseed oil. Choose pine or poplar wood. The Civil War was in many cases a "spit and polish" war for the troops and a button polishing shield was a must have. This shield is an exact copy of the original and is made of 24 gauge solid brass. The shield measures 2" x 7 3/4" and is authentic in size and shape except for the modern makers mark encircling the grommet to distinguish the piece from an original. The shield is clasped around the uniform buttons when polishing to prevent the uniform from getting stained by the polishing paste. The folding pocket knife has a multitude of uses. Period correct Blue Glass Bottle with Cork Stopper. The bottle is about 12 1/2 inches tall and 2 3/4 inches in diameter. 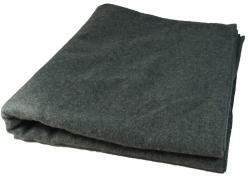 This heavy weight, 3.75 pound wool blend blanket is 66" x 84". This soft wool blanket is not scratchy. 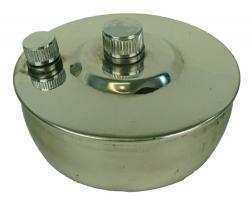 This compact stainless steel Civil War Burnul Oil Lantern comes complete with wick. The lantern is sealed for leak-proof use. The lamp measures 3 inches wide by 1 1/2 inches tall. Click on the picture for more images. This compact folding tin candle lantern opens to hold a candle. The adjustable tin reflectors direct the candle light outwards. Candle lanterns were common during the Civil War. The lantern measures 3 inches wide by 1 1/2 inches deep by 5 inches tall. Click on the picture for more images. This wood lantern features a tin reflector to direct the candle light outwards. The lantern may be placed on a table or hung on a rafter or post. Candle lanterns were common during the Civil War and were often left unstained. This lantern is available stained or unstained. The lantern measures 4" wide by 5" deep by 9" tall. Click on the picture for more images. This wood lantern has a glass chimney, metal heat deflector on the top and a wire carrying handle. The chimney lifts up to insert or light the candle. The top can also be removed by removing the four pins on the top and lifting off the top. The lantern measures 5" wide by 5" deep by 10 1/2" tall not including the wire handle. The handle measures 10". Click on the picture for more images. 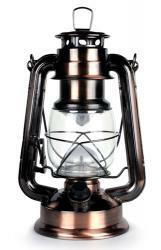 This wood and glass lantern has 4 glass panels, a top metal heat deflector, and a wire carrying handle. This style features a front sliding glass panel to insert or light the candle. The top can also be removed by removing the four pins on the top and lifting off the top. This wood and glass lantern has a door that opens, a top metal heat deflector, and a wire carrying handle. This style features a front, leather latched and hinged wood and glass door to insert or light the candle. The top can also be removed by removing the four pins on the top and lifting off the top. The Old Red Lantern is a 15 LED, 100 lumen lantern that brings classic charm and warm, inviting light to any space. It's safe for use in tents and barns. Blending rustic design with modern technology, the Old Red features a realistic flickering flame and a control to adjust the amount of light that is generated. No smoke and no fire...the adjustable light output allows Old Red to operate for hours on end with 4 AA batteries, which are included. On HIGH (100 Lumens) Old Red operates for about 9 hours. On LOW, Old Red operates for about 80 hours. The Old Red Lantern is 9 inches high x 4.5 inches wide and is lightweight at about 0.9 pounds. The Old red Lantern features metal construction with a wire-guarded glass globe. It can sit on a table or hang from the wire hook. This 15 LED Lantern is the perfect blend between classic design and modern technology. The lantern is lit by 15 high-power LEDs producing an output of 25 lumens. This 9 inch high metal lantern has a wire-guard to protect the glass globe. No kerosene, no lamp oil and no citronella…this 15 LED is completely battery operated, powered by 2 D batteries (batteries not included.) To maintain the functionality of a traditional kerosene lantern, this 15 LED Lantern has a control to adjust the amount of light that is generated. A reflector is positioned above the LEDs to cast the light evenly in every direction. Perfect for indoor or outdoor use, this lantern generates over 96 hours of continuous bright light. The 15 LED Lantern, the traditional lantern look with efficient LED lighting! The 15 LED Lantern is (H) 9 inches High x 4.5 inches Wide and weighs about 0.9 pounds. This black painted tin and glass lantern has a sliding glass panel to insert the candle and a wire carrying handle. The lantern measures 4 1/2" wide by 1 3/4" deep by 6 1/2" tall not including the wire handle. The handle measures 10". Click on the picture for more images. This Metal Oil Lantern has the classic design that has been around since 1850. The 12" high lantern has a wire-guard to protect the glass globe. There is a bail for carrying the lantern and a hook hanging. The 12 oz. fuel tank provides up to 35 hours of burn time with a full tank. The lantern burns lamp oil, citronella, or kerosene ONLY. A control knob adjusts the wick height and light output. The fuel tank cap is child-proof. Filling funnel and extra wick included. Available in Black or Red metal. The white candle is approximately 5" tall and fits our wood and tin candle lanterns. This bugle is correct for the Civil War period. It is used by both CS and US forces. The bugle is made of brass. It is about 11" long. This pen is a one-of-akind piece. This Civil War pen is inspired by the era when correspondence was an art form and craftsmanship was honored. With a remarkably detailed Model 1861 Springfield Rifle Musket Clip, a replica 58 Caliber Minie Ball pen cap, and 44 replica Caliber Colt Army bullet on the pen tip, this pen captures one of the most important times in our Nation's history. The pen shown is made of Bocote wood and features a Chrome metal finish. Other options of metal finishes are available. Please select from the drop down list. Click on the images for more pictures. Enhance the presentation of this anniversary pen with a velvet lined, maple wood pen case. This pen is hand turned by a master wood worker in Emmett Idaho. Since the pen is custom made to your specification, please allow 3 weeks for delivery. The pen shown is made of Myrtle wood and features a Satin metal finish. Other North American woods and metal finishes are available. Please select from the drop down list. Click on the picture to see more images. The pen shown is made of Zebra wood and features a Gunmetal metal finish. Other options of metal finishes are available. Please select from the drop down list. Click on the images for more pictures. 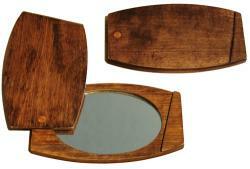 The 19th century campaign lap desk is handcrafted from high-quality poplar hardwood. It would add both a practical and stylish detail to your camp impression. The desk measures 16" long x 11" wide x 5" high. The top is sloped for ease of writing and has a convenient pen/pencil holder groove. The desk features brass hinges and hasp and a single inside divider. The campaign lap desk is available unstained or stained in a walnut finish. NOTE: Additional shipping charges will be applied due to size of box. The common ballot box was used for both official and recreational purposes. Companies sometimes elected officers and NCO's or chose soldiers for various work details using the ballot box. When they were bored, soldiers might vote on any number of issues of the day. Design consisted of a rectangular box with a hinged lid on top and a handle on the back. The open front portion had a small hole in the body of the box. A supply of black and white marbles were kept with the box. When time to vote, each man was given a black marble and a white marble. Typically the white marbles were assigned "yes" or 'approve" and the black marble were assigned "no" or "disapprove" but they could be assigned other specific votes if needed. To cast the vote, the ballot box was extended toward each man by the handle and the secret vote was cast by placing the selected marble through the hole into the closed box. The marbles were then counted and the vote outcome determined. The ballot box is made of poplar wood hand rubbed with linseed oil. 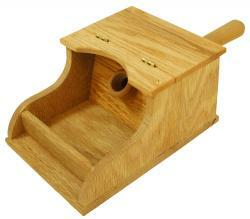 A ballot box made of oak wood is available for an addition $10.00. Marbles NOT included. Marbles are currently not available. These dice are hand-made of natural horn. The game of Fox & Geese has been around for several centuries. Both Confederate and Union soldiers suffered from boredom. Reading, letter writing, and games helped pass the time. In the game of Fox & Geese, the single predator, the Fox, attempts to remove all the other animals, the Geese. While the Geese attempt to surround the Fox and prevent it from moving. If the player controlling the Geese prevents the Fox from moving, he wins. 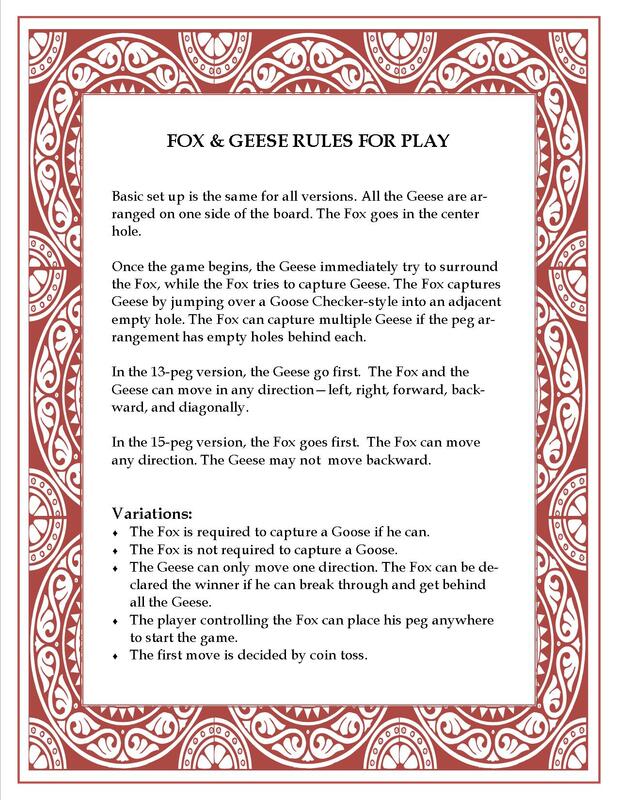 If the player controlling the Fox eliminates enough Geese so that the Fox cannot be surrounded, he wins. There are 2 versions of Fox & Geese - a 13 Geese version and a 15 Geese version. Each has rule variations. This board has 15 Geese enabling playing of the 13 or 15 Geese version. The game board measures approximately 10" x 5". Rules for all versions are included with the game. Click Here to download a copy of the rules. There are 2 versions of Fox & Geese - a 13 Geese version and a 15 Geese version. Each has rule variations. This board has 15 Geese enabling playing of the 13 or 15 Geese version. This game board could have eaily been made by the soldier using materials easily found in the field such as discarded crate wood and square headed nails. 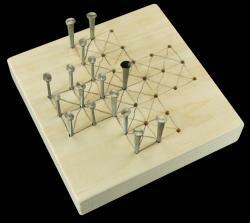 The field made game board measures approximately 4.5" x 4.5". This authentic reproduction of an 1858 playing card deck by Samuel Hart & Co. of 55 cards features full-length, single-ended court figures. The cards have an unusual pictorial back design of a huntress peering across the landscape. The cards have square corners as in the original deck. Per the traditional style, there are no indices in the corners of the cards. This authentic reproduction of a Civil War era poker deck by Lawrence, Cohen, & Co. of 55 cards features full-length, single-ended court figures. 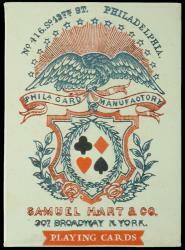 The cards have a unusual double-ended card back design which features four patriotic shields with 13 stars. 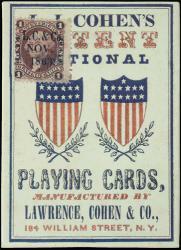 The cards have square corners as in the original 1863 deck. Per the traditional style, there are no indices in the corners of the cards. The box shows a reproduction of the tax stamp with the cancellation dated November 1863. 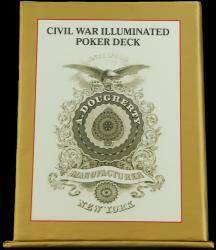 This authentic reproduction of a Civil War era poker deck of 55 cards features full-length, single-ended court figures. 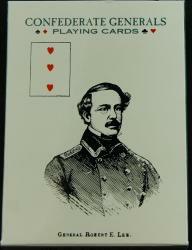 The cards have square corners as in the original 1864 deck. Per the traditional style, there are no indices in the corners of the cards. 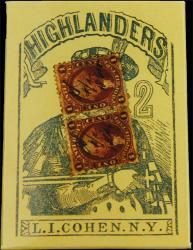 The original wrapper contained two 1 cent proprietary tax stamps valid from 1862-1871. The box shows a reproduction of these tax stamps with the hand cancellation dated June 2, 1864. This card deck describes and illustrates the weaponry used by soldiers during America's most divisive battles. This educational card game is great for the entire family. 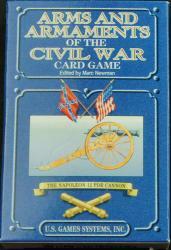 The Civil War series card game honors the people and events of the war. The decks may be used for most standard card games. Instructions are included with the deck for the specific card game. For decades, African-American soldiers of the US Military remained unsung heroes. The black regiments, first formed in 1866, quickly earned the respect of all. This beautifully illustrated deck of 54 cards pays homage to those individuals who helped change the face of America. This educational card game is great for the entire family. The deck may be used for most standard card games. Instructions are included with the deck for the specific card game. This deck is a reproduction of the playing cards originally published in 1863 by M. Nelson. 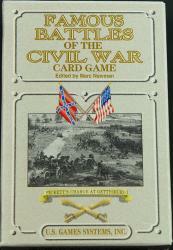 Each card features an engraved portrait of a Confederate General or statesman of the Confederacy. 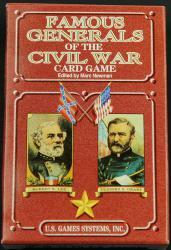 This card deck features facts about the famous battles of the civil War, with background details on leaders, locations, and outcomes. This educational card game is great for the entire family. 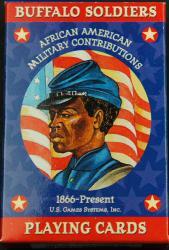 This card deck features 13 important leaders of the Civil War who served their country in its desperate struggle. This educational card game is great for the entire family. 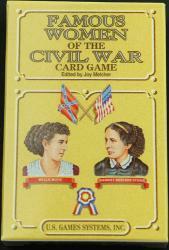 This card deck highlights the important contributions of 13 heroic women during the Civil War. This educational card game is great for the entire family. 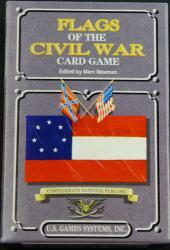 This card deck describes and illustrates Union and Confederate battle flags of the Civil War. This educational card game is great for the entire family. This deck is a reproduction of the playing cards originally published in 1863 by M. Nelson. 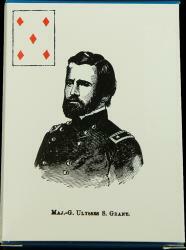 Each card features an engraved portrait of a Union General or statesman of the Union. Back by popular demand. Originally published in 1865 by Andrew Dougherty, this authentic reproduction of the Civil War Illuminated Playing Card Deck borrows its name and appearance from illuminated medieval manuscripts. The deck is beautifully illuminated with gold ink to recreate the look of the original cards. In the style of the times, this deck features full-length, single-ended court figures, square corners, and traditional non-indexed (no suites nor indices in the corners) styling. 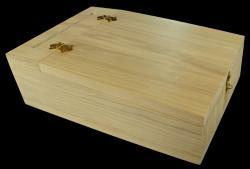 The deck is packaged in a sturdy upright case. Antique watch made by Sears Roebuck & Company Chicago Illinois USA. 17 jewels. Stem-wind, lever-set. Size 18 movement. The case is made of Silverode and is labeled Made in Philadelphia. Serial Number 1709531. This watch runs. Antique Ladies watch made by Elgin National Watch Company. Nice gold filled hunter case with minimal wear. 15 jewels. Stem-wind, stem-set. Size 8 movement. Serial Number 22835498. This watch runs. Antique watch made by Elgin National Watch Company. 17 jewels. Stem-wind, stem-set. Size 14 movement. The case is Gold Filled 14 karat. Serial Number 22384792. This watch will run but it has been wound tightly. Antique #910 watch made by Hamilton Watch Company Lancaster PA. 17 jewels adjusted. Stem-wind, stem-set. Size 10 movement. The case is Gold Filled. Serial Number 1798357. The case is labeled "Guaranteed 25 Years". The watch opens from the front. This watch does not run. The tip of the second hand has broken off. Very pretty antique foreign made Ladies watch. Nice gold filled case with minimal wear. Fancy Gold Filled hour and minute hands. Roman numeral dial. 5-7 jewels. Stem-wind, pin-set. Size 8 movement. The case is engraved "Robert Heinze (?) Cainsdorf". This watch runs. Antique Ladies watch made by Columbus Watch Company. Nice gold filled case with a filigree edge and fancy engravings of birds and buildings. 11 jewels. Stem-wind, lever-set. Size 8 movement. Serial Number 257619. This watch has been wound too tightly and doesn't run. Pre-Civil War antique watch made by John Davies Chester. Unknown number of jewels. Key-wind, Key-set. Size 10 movement. The case is Sterling Silver and marked with a Lion. This watch has an open face front. Serial Number 28317. This watch does not run and the crystal is loose. The Roman numeral dial makes this an excellent watch for the Civil War re-enactor or collector. Antique watch made by Colonial Waltham USA. Classy art deco dial. 17 jewels. Stem-wind, stem-set. Size 10 or 12 movement. The case is 10 K rolled gold plate. "DWS" is engraved on the case back. Serial Number 29414171. This watch runs. The plastic crystal is loose. Antique watch made by Elgin National Watch Company. Very nice gold dial. 15 jewels. Stem-wind, stem-set. Size 12 movement. The case is Gold Filled and labeled "25 years". Serial Number 29092943. This watch runs. Antique watch made by Elgin National Watch Company. 17 jewels. Stem-wind, stem-set. The movement may be a size 12. The case is made of Silverode. Serial Number 2257717. This watch runs. Antique watch made by Elgin National Watch Company. 17 jewels. Stem-wind, stem-set. Size 14 movement. "Adjusted". The Hunter Case is Gold Filled and labeled "Warranted to wear permanently". Serial Number 14698141. This watch runs. The case is engraved "From Parents Dec 24th 1904 on 21st Birthday". The Roman numeral dial makes this an excellent choice for the Civil War Re-enactor.